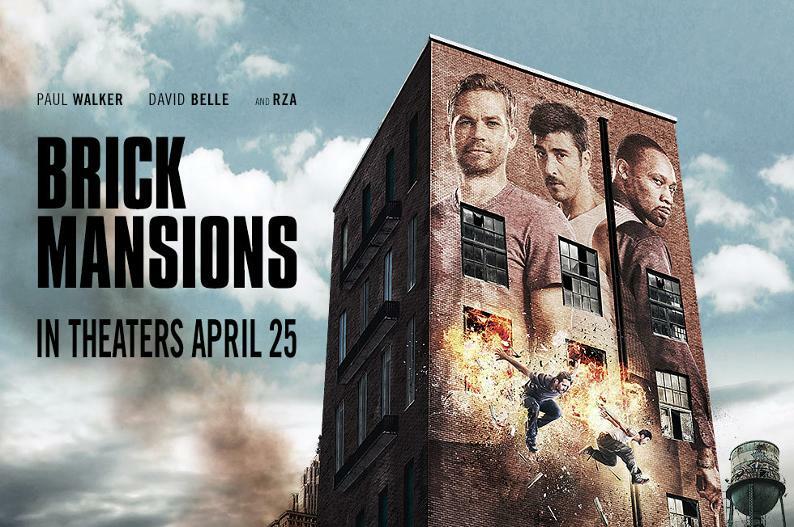 "Brick Mansions" is a remake of Luc Besson's 2004 French Film "District B13". The action now moves from Paris to Detroit. French star David Belle reprises his role from the original; Belle is famous for street-art fighting where he uses things like walls, windows, fire escapes and roofs to acrobatically move through streets and buildings. However, sadly the one thing that "Brick Mansions" will be remembered for is that it's the last starring role for Paul Walker who tragically died in a recent car crash. The year is now 2018 and a section of Detroit called Brick Mansions has been blocked off from the rest of the city with a 40-foot wall, the citizens inside have been abandoned by society allowing crime to run rampant. In a great opening scene cop Damien Collier (Walker) is on an undercover mission to bust a big time drug dealer, it all goes horribly wrong and Collier has to improvise, this leads to him chasing the bad guys whilst hanging out of the boot of their car. Meanwhile in Brick mansions Lino (David Belle) is the one man who is taking a stand against the corruption and lawlessness, unfortunately in doing so he crosses a local drug kingpin, Tremaine Alexander (RZA). Alexander seeking revenge on Lino kidnaps his girlfriend (Catalina Denis), a saucy waitress who appears to wear what looks like a skimpy St Trinians type school uniform. As well as being a drug dealer Alexander is also in the arms business and has acquired a neutron bomb. Tasked to get the bomb back is cop Damien Collier (Paul Walker). In order to get into the Mansions and recover the bomb Collier goes undercover and recruits Lino to help him. The plot is absurd as Lino and Collier manage to defeat entire crowds of heavily armed villains simply by flipping and jumping faster than speeding bullets. Collier, with a touch of irony, is also a dab hand behind the wheel of high performance cars, there are various scenes where he crashes cars and walks away without a scratch, knowing now what fate had in store for Walker it does make for uncomfortable viewing. For the males, who I imagine will make up the majority of the audience, there’s also a girl-on-girl fighting action between Lino’s kidnapped girlfriend and Tremaine’s sadistic henchwoman (Ayisha Issa), who likes to prowl around the projects in a black-leather bustier, fishnets and knee-high boots. The scene looks like someone has said, "we need to see two girls cat fighting, stick this in". Walker is as charismatic as always and does his best amongst the nonsense that's going on around him. Unfortunately Belles acting is not as agile as his body as he's as wooden as a plank of wood, acting is obviously not his strong point. Brick Mansions is fun and might get a following on DVD, unfortunately though, it won't be remembered as Paul Walkers finest hour.